» Sport » Promotion… is it up for grabs now? Promotion… is it up for grabs now? Words which, 25 years on, still send a shiver down the spine of Arsenal fans. But many of the 1,420 Woking fans at Kingfield watching their own promotion decider back in the same month of May 1989, would have felt more than just a slight affinity with those 40,000 smug Liverpool fans who all thought they had it in the bag. After the bitterly disappointing last day 2-2 draw against Lewes the Cards missed out on promotion by a solitary point to Basingstoke Town. The new-look Cards were hoping to put all that behind them and make it third time lucky for promotion to the Isthmian League Premier, starting with this first home game of the season against rivals Walton & Hersham. Manager Geoff Chapple, his coach Fred Callaghan, and chief scout Colin Lippiatt had got the likable rogue Andy Parr to return after a season at Chertsey, defenders Stewart Mitchell and Andy Russell were in to toughen up the back four and Mark Franks (returning for his second spell at Kingfield) with Gary Hall, bolstered the already impressive forward line. 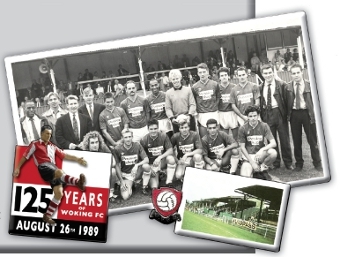 The omens were good as Woking had already recorded their first ‘away’ victory of the season the previous Saturday at Kingfield (Croydon’s ground was not available), with former Highlands schoolboy Terry Worsfold and Hall grabbing the goals against an eager young Croydon side. The game was officiated by our ‘old friend’ from Enfield, Mr Vosper. For many years I was led to believe by some of the old codgers around me on Moaner’s Corner that this charming referee’s name wasn’t in fact Paul Vosper, but you haven’t got a clue have you, Vosper? (and worse besides). The first 20 minutes were spent tentatively testing each other out until the Cards started to gain superiority with a number of chances falling to Hall and Worsfold. As the home side gained fluency, so Trevor Baron started to move purposely forward, culminating on 29 minutes when Andy Russell headed instinctively through to Baron, who elegantly shot home past Adrian Blake in the Swans goal from 15 yards. Tim Buzaglo added Woking’s second on 36 minutes. But despite McGiven slamming a shot off the underside of the crossbar which rebounded off the line for the Swans, the Cards reached the interval with a comfortable two-goal cushion. Walton abandoned their sweeper system in what was a lively second half and star player David Jones soon had them back in the game with a left-foot strike that evaded the home keeper’s outstretched right hand. The Cards responded immediately by introducing the inimitable ‘Biggo’. As always, everyone’s favourite painter and decorator was soon in the thick of the action, going close to scoring on a number of occasions, while receiving, as was quite often the case, an opposition elbow in the face for his efforts. But it was down to Paul Mulvaney to make sure of the spoils in the 80th minute with a brilliant left footed curling effort from 16 yards. The Cards were unable to capitalise further when, as an eventful half drew to a close, a concussed Walton keeper Blake had to be replaced after colliding with a post.